Deciphering Cisco Prime License Manager: What is using what licenses, how can I tell which users are being counted as CUWL Std? How do I know which users are Enhanced? Remember that funny joke Cisco told us a few years ago? How they where going to make licensing for CUCM way easier? How everything would be so much better with Prime License Manager? Ha Ha they are so funny! But seriously, short of having a certificate program for their licensing, Cisco Licensing for collaboration platforms remains incredibly difficult and confusing, especially when it comes to maintenance. To help make a bit more sense of it all, this post will be continously updated as I find out new licensing issues and how to resolve them. As you can see, on the right hand side you can actually click the report to get a list of the users who are consuming particular types of licenses, this really helps narrow it down. You may find that after you make changes to these users to try and avoid the license count issues you will have to click update usage details, as well as sync the product instance in your prime license manager. Great Reference for CLI Commands on CUCM including how to change Prime License username etc. VIRL has been around for a little while now, for those like me who bit the bullet and paid the $150 asking price it's a decent product BUT a lot of the functionality you could obtain in GNS with admittedly older hardware platforms. The fundamental missing component for GNS has always been a lack of Catalyst Switch Support. GNS 0.9.1.7 includes something called "IOSl2"
A change to the ultimate destination endpoint of a request. A change in the Request-URI of a request that was not caused by a routing decision. This is also sometimes called a deflection or redirection. A diversion can occur when the “user” portion of the Request-URI is changed for a reason other than expansion or translation. A diversion can occur when only the “host” portion of the Request-URI has changed if the change was due to a non-routing decision. In other words, some sort of forward set on the users phone. Edit: I have found a great free enhancement for Cisco Mediasense http://www.aurus5.com/phoneup/record/mediasense.php that allows you to easily search and categorize records. I haven't personally checked it out yet but it looks interesting. 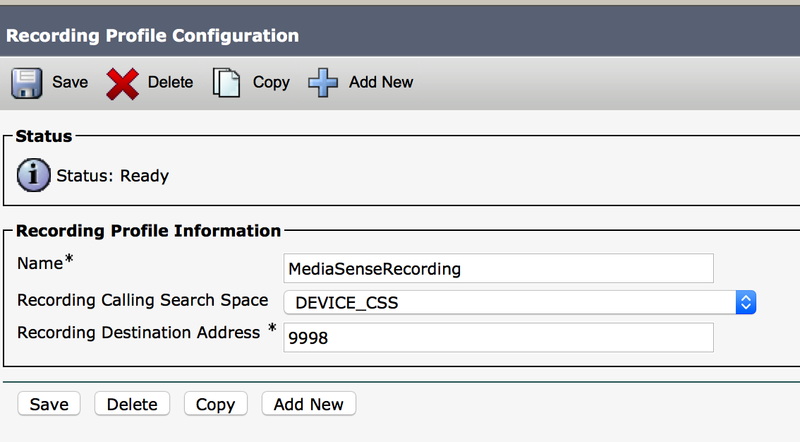 I recently had to install Cisco MediaSense to configure another feature, Cisco Mediasense from everything I can tell is essentially a fairly rudimentary call recording solution. Cisco talk a lot about it's open API, network-based etc. etc. but for me it's really just a great way to get cheap recording. To deploy it, first all you need to do is obtain the ISO and install it as a virtual machine just like any other Voice application. It is licensed per concurrent recording, from what I could say the price per user hovers between $20 to $40 bucks, so for an organization with a T1 and a small call center it's pretty cost effective, around $400 to $500 bucks (maybe a little more once maintenance is added) to record up to 24 sessions at a time. There is another part number available for it: MCP-10X-AUD-10PACK which includes 10 concurrent ports. The configuration of media sense itself is extremely straightforward, when you first login to the mediasense server it will prompt you to configure a username/password for connectivity to AXL on CUCM. Note: this SHOULD NOT and infact CANNOT be your usual admin user, resist the temptation to just slack off and use your admin account and instead create a new AXL user for this, they will also require CM administration privileges. Once this is done MediaSense is essentially configured! Their is very little you can configure except for selecting which users can utilize the 'Search and play' functionality. The fact that they call this section Mediasense API user, along with the very limited functionality available to the user makes Cisco's insistence that this is simply a device for COLLECTING the media, not for organizing/searching through it even more obvious. You can login with the user you defined as a mediasense API user previously. The GUI is pretty limited as you can see and you can see in terms of searching and organizing, but you can export the recordings, save them and even perform a live monitor by clicking on "Active Calls"
For CUCM configuration the first step is to configure a SIP trunk pointing to the IP address of the Mediasense server, this is straightforward so the steps for this are not outlined below. Once this is done, you need to create a route pattern and point a number to this SIP trunk. So there you have it, cheap and cheerful call recording that might be all you need for certain situations.